Frankie and Clover's Strictly Come Dancing Blog! : Jai... NO! Well Daisy looks like a sheer Delight as Mary Poppins, Aljaz carries Bert off pretty well too. Despite my initial reservations, the song was a delight too, perfect for a quickstep, you can't help be light-footed in a number like this. I feel like it could've been better in a few weeks when she has a bit more ballroom under her belt, but she carried it off with aplomb (sorry Clover, I stole aplomb). Aplomb is a great word. This was nippy and nifty and, despite my utter disgust at the very thought of theme weeks, I thought Daisy and Aljaz pulled this off rather nicely. There was plenty enough quickstep to stop me moaning throughout and that's quite an achievement. Fast becoming one of my favourite pairings. Well, we don't like too much theming, but Brendan looks like he's a been bit ill rather than a vampire. On the other side, Anastacia looked radiant, and despite the injury, we wanted to see some nice soft ballroom from her and we got it. It was simple, classic VW, basically forgetting that it was Movie Week. Good work guys, I hope it will send them through to next week. Other than Brendan being painted the colour of a snail's trail, this was fine. It didn't set the world alight, but for a theme week, it wasn't too themey (Brendan has a knack with this sometimes) and I'm all over that. I hope Anastacia gets the chance to dance next week as she does have potential but I'm afraid the necessary injury-avoiding caution she displayed in this routine could send her packing. Oh you British public, you are heartless. Guyliner AND a Zorro mask, oh you spoil us Strictly...and actually, this make perfect sense as a paso anyway. Spanish, innit. This was easily my favourite dance from Danny so far, it just wasn't as cocky or uber-slick like the others. The judges raved about his lines, I think they were a bit overblown actually, he looked like a penguin at times. It was as slick as oil sliding off a greasy spoon but dare I say it, also, too...dainty. Come on, man, I want a fierce appel! I want you to stomp that floor like you're a toddler having a tantrum in Tesco. Ole! Lesley winning the Kirsty Gallagher Award for the least glamorous costume, you do have the disadvantage that hardly anyone is going to know what this dance is based on. I thought this was a cracking routine actually, loads of quickstep content, but also some fun bits that still didn't manage to break the flow of everything - Lesley has great musicality. No, it wasn't perfect, and they are never going to get over that height difference, but they have certainly earned a place for next week. She's light on her feet, in time and more than a match for Anton. Other than copious gapping, I thought this was pretty good. 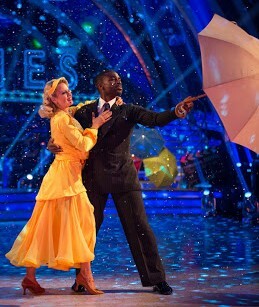 Like Daisy's it had enough actual quickstep content to allow me to overlook the ridiculous costumes and theme. The music was fitting too. Lesley is far from a joke contestant and I'm looking forward to seeing what they bring next week. Now, the training footage they showed on ITT was basically a game of 'spot the salsa step' and...that was pretty much what happened in the show. Like Len, I noticed a little bit in the middle, and actually a moment of decent hip action from Will at one point. But we are talking about 10 seconds of a 90 second dance. There are no words. You have to do some salsa to call it salsa. This is like making someone a pancake and insisting on telling them it's spaghetti bolognese. Seriously, what is the point? Speaking of lack of basic dance content, it was fun watching Naga waggle a torch, wasn't it? Really added to the drama of a tango. Actually, saying that, the song choice worked a lot better than some others, and she was obviously a lot more suited to it than the cha cha. Bruno was actually right about her having flashes of greatness marred by a lack of confidence. I was also muchos pleased to see Pasha's Cold War Spy Roll Neck Jumper make it onto the main shows. Wow, this was a long show wasn't it? I don't even remember this dance. Were they dressed as the people you're not supposed to see changing the sets at am dram productions? This has been a bonkers journey already, so a Charleston and Fred Flintstone for Rinder seemed totally normal. Also, I've been humming the theme tune all week and it totally makes sense as a song choice. But then the routine happened, and it somehow seemed to missing something. It was a bit sloppy, and may have been a bit too technical for him, because it was missing the joy he usually exudes in a performance. Also, WHY isn't Oksana in a ginger wig as Wilma? It is the Strictly Year of the Ginger! Our first opportunity to see if Ore can carry off a bit of smooth ballroom, and when you've got an American Smooth to Singin' in the Rain all the pieces are there. He carried it off...just. I think he's still more confident out of hold than in it, and too much on the toes, but the whole thing fit together in a way that was missing from Rinder's Charleston. I was also happy to see they didn't make a meal of the lifts, they fit into the routine rather than Ore throwing Jo over his head for no reason. I wanted to like this more than I did. He has huge potential and I have to say, looked rather dashing in his suit, but something was missing here. The fact he was on his toes for every part of the routine I could see didn't help. Joanne's has demonstrated on It Takes Two that she's a talented teacher so I'm hoping to see something better from these two next week. Oh my word, that is the outfit of our Moulin Rouge-SCD mash-up dreams. What's more, Laura threw herself into this in a way we've not seen her perform a routine before. I don't think I glanced at Giovanni once during the routine, apart from gratuitous point-baiting by flirting with Bruno. I feel like it would've been better without the lifts though, Laura was partying on down until they came along and then was properly nervous. Greg being endearingly awful in his VT acting AND dressed in a sub-Game of Thrones outfit, what a treat. I thought this was going to be waaaay too slow for an American Smooth, but I should have learned by now not to underestimate the genius of Natalie Lowe. He's a dab hand at lifts and she's the ultimate waltz teacher, all the pieces were there and I couldn't see them *sob* there was a typically movie-esque happy ending. I swing between liking and disliking these two, but they definitely won me over with this one. I have to say, I was surprised at the lack of gymnastics in this, I was expecting Claudia just to be backflipping the length of the floor, but it was all totally appropriate. Yes, she was a bit sloppy in places, but there was swivel and they'd obviously worked hard and pulled it out of the bag on the night, one slip up and it would've fallen to pieces. I agree with Frankie that the gymnastic-level was just about appropriate. She's very good but I'm tempted to put gymnasts (female at least) in the ringer-zone due to their floor routines to music. Her charleston tonight did have a stop-start quality, as though she were pausing for breath before each move. I'd like to see a smoother performance but I suspect that will come with experience. I have to say I wasn't looking forward to this, not in a 'OMG this will be a disaster' way, more of a 'meh, movie week' way. However, through sheer force of will they managed to bring some aggression and intensity to it, and brought out the staccato beat of the bassline. I think this was more technically achieved than her Charleston actually. Not one for the ages, but better than expected. As I have said many times, some dances are as much about the mood and style, as the actual steps. Tango is one of those dances. You take away the tango mood, put it to inappropriate music, and it's no longer really a tango. Not saying it was danced badly - it wasn't - but I didn't like it. After last week's (literally) barnstorming performance, the question was whether he could pull it off again, they certainly beat it for surreality on costume! Now, giving him a samba at this stage seemed a little mean, but Katya didn't try and bottle it, they were actually doing a samba routine. Ed, like Jeremy Vine last year, might not be the most naturally talented of dancers, but give him a routine and he will learn every step of it and remember it on the night - some people struggle with that throughout the whole competition. Oh Ed, bobbing up and down dressed as a corn on the cob. I loved it. Frankie compared him to Jeremy Vine, and that's fair. Both men actually do dance. They're not lolloping about like Ann Widdecombe. Both have good timing and give it their all. He's an absolute joy to watch for this very reason, and, I hate to use the cliche, but that is what Strictly is all about, after all. Louise with a bubble perm and wearing something that doesn't resemble a beige duvet cover! I have to say, it is easily the happiest she's looked doing a dance, but it was also the sloppiest. She's obviously more of a ballroom one, and often looked like she was thinking of the steps, but expectations have been very high on her. Easily the dance of hers I most enjoyed though. Kevin dances for himself, not for his partner. Sad but really does seem to be true. It's been demonstrated with every celebrity he's had. Instead of throwing more and more complicated steps at Louise, he should strip it back and teach her some technique. She's naturally very good and that cha cha could have been at a professional-like level had her legs been straighter and the moves been sharper. Come on, man!